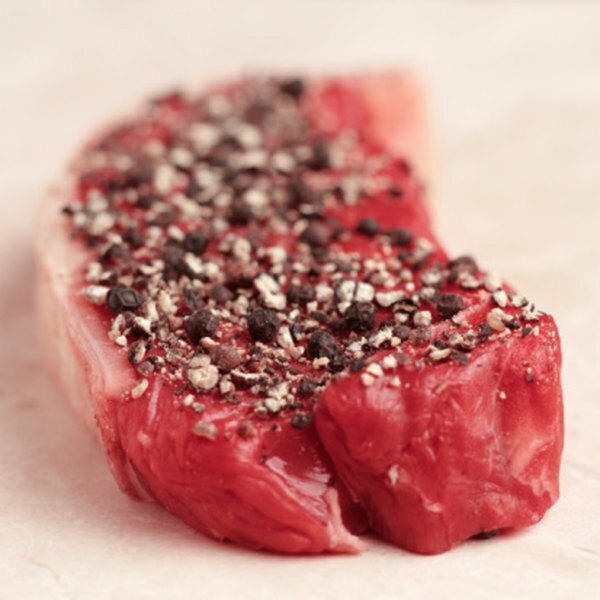 Coat your strip steaks with seasonings such as pepper and kosher salt. Strip steaks, also referred to as New York Strip, Kansas City Steak or Shell Steak, are tender and lean cuts of beef that come from the back area of the cow. Because they are naturally flavorful, they are an ideal addition to any meal or recipe. Cooking your strip steaks in a skillet will help to caramelize and sear the outside of the meat while keeping the inside tender and juicy. Open the strip steak packaging and drain way any juices. Dry off the steaks with paper towels and allow them to come to room temperature. Mix together oil and seasonings, such as 1 tbsp of pepper and kosher salt, in a bowl and pat on the steaks evenly. Preheat your oven to 500 degrees F. Place a large ovenproof skillet inside the oven and remove it once the oven reaches 500 degrees F.
Position the skillet on a burner over high heat and carefully add your strip steaks. Do not crowd your steaks -- never allow any to touch while cooking. Cook each side for 30 seconds. Put the steaks in the oven on the skillet for about 2 minutes on each side. Remove from the oven if you prefer your steaks medium-rare. Add an additional 2 minutes to the cooking time if you prefer medium or well done. Place the finished steaks on a cutting board, cover with aluminum foil and allow them to rest for about 10 minutes. Cut the steaks against the grain and serve. Thekitchn.com suggests making a sauce with the pan drippings from the steak. Just add about 1/2 cup of chicken or beef broth and 1/2 cup of red wine to your pan while your steaks are resting. Boil and then lower the heat to a simmer and scrape the bottom of the pan. Pour over the steaks when the mixture has reduced to about half. Use your thickest pot holder when touching the handle of the pan as it will be extremely hot. 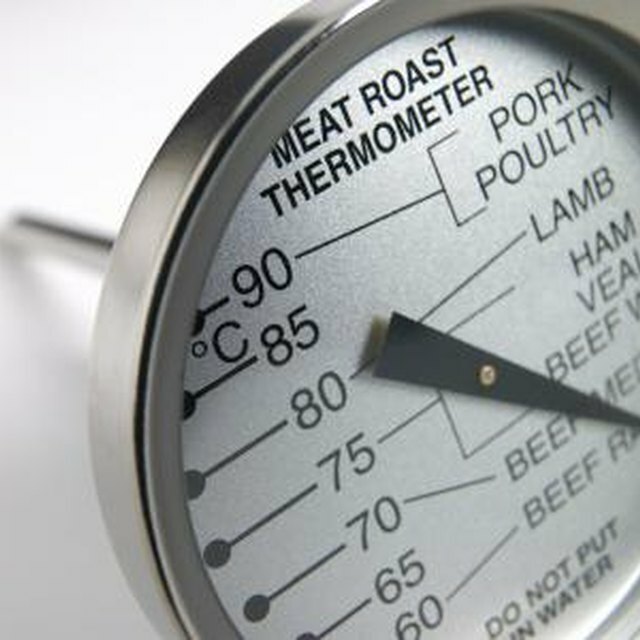 Because harmful bacteria can reside in undercooked meat, the United States Department of Agriculture recommends cooking your steaks until they reach an internal temperature of at least 145 degrees F.